RoadSafe Expands Operations in Tennessee - RoadSafe Traffic Systems, Inc.
Chicago, IL (January 30, 2019) RoadSafe Traffic Systems, the nation’s largest provider of traffic safety services and products, announced today that their Industrial Services Group (ISG) has expanded operations in the Knoxville, Tennessee area. 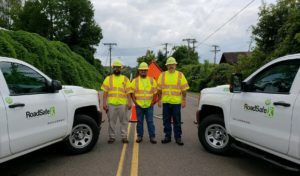 What started out in 2018 with two RoadSafe crews handling temporary traffic control and protection services for a Knoxville area utilities company, has expanded to significantly more utility related work and additional work with a highway lighting contractor selected to retrofit area streetlights. With the increased volume of work, RoadSafe set up branch operations just outside of Knoxville in Powell, Tennessee with James Langford as Lead Project Manager, a 20-year veteran in traffic safety.